Whether you are removing large burrs or achieving fine RA finishes we can help you find the right media for your applications. Without the right media for your needs, it will reduce the value you could have. A tier 1 automotive drive line parts manufacturer was using 12,000 pounds per year of media that cost $.35 per pound. After a month of testing and approvals, this manufacturer changed to a medium-cut triangle media that cost $.82 per pound. the savings come from the fact that they only needed to purchase 1,500 pounds to 2,000 pounds per year, about $3000 per year savings. Additionally, they saved $10,000 on wet media sludge disposal per year. 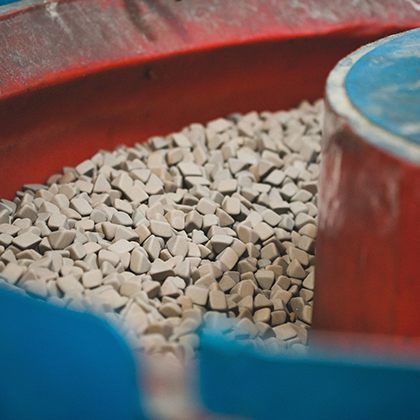 Ceramic vibratory media is group into 4 major groups of cutting speed, 8 different shapes, and 10 different sizes. Rodeco can help determine the best for your application. XC is more of an aggressive version of the C Bond brother. Excellent at removing large burrs. 40 Bond is the fastest cutting media. When short time cycles are key, 40 Bond is the answer. WK Bond provides fast cutting with a high concentration of abrasives, but it also has excellent life with lower wear rates. The new 120 C and GC Bonds are at the top in terms of density at 125 pounds per cubic foot. This shortens time cycles and reduces overall costs. Both media are non stock, so custom sizes are available. Medium cutting media gives some of both worlds: brightness and cut. The C Bond has been the industry standard for many years. The ECH Bond provides performance at an economical price. The 30 Bond provides a smoother finish by using a finer-grain abrasive. All are in the 90 to 95 pound per cubic foot range. The F Bond and 20 Bond of ceramic media offer light coloring, excellent color and brightness, and light deburring to parts. They hold their shape and are long lasting. These are very hard, abrasive-free bonds of media that are used primarily to maximize the brightness of parts. Other applications include working well with chemical accelerators or as a carrier of loose abrasive compounds. The F Bond and 20 Bond of ceramic media offer light cutting and excellent color and brightness. A completely new and improved line of fast-cutting polyester media, designed and formulated to provide a wider range of surface finishes. It contains agents that improve overall performance considerably which are technically superior to standard resin bonded media and urea formaldehyde media. Our new and improved media also has an average bulk density of 100 pounds per cubic foot. This represents over 35% higher density than standard plastic media and 20% higher density than most ceramic media. It has been designed to reduce standard plastic media process time by 50% while improving surface finish without additional cost. It will also cut as fast as most ceramic media while producing a superior surface without hardening the metal surface. When used with proper water and compound flow rate, our new and improved media reduces foaming and allows faster settlement of solids. It will produce a clean surface finish on ferrous, non-ferrous, or plastic components, and it will not fragment. Don’t waste your media or your money. Contact Rodeco to get the exact right media and process to maximize your return on investment. Our plastic vibratory media is manufactured to our own custom-formulated specifications and contains only the finest raw materials available. Low-density media is used within the metal industry for surface preparation and improvement of most metals such as aluminum, brass, copper, zinc, and plastic. Low-density media will reduce distortion, impingement, and burr roll over while producing excellent finishes prior to plating or painting. Fine finishes as well as aggressive cutting can be achieved. Steel media has strengths and limitations. It is a non-abrasive media that maintains its dimensions and minimizes solids in the waste water. Patented abrasive surface puts teeth into finishing for fast, heavy deburring, burnishing, and material removal. Available in three standard sizes. 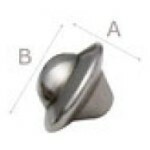 This design combines the burnishing abilities of balls and cones into one scientifically-proportioned shape. 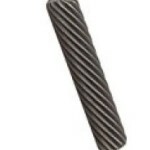 Tapering to pointed ends, pins reach into recesses and grooves, deflash throughholes, and clean threaded areas. Let the Rodeco team help you improve your vibratory process. We prove the process in our lab first saving you valuable time and money!